Q+A: Venezuela in crisis: how did we get here? Venezuela is once again at a crossroads. The opposition leader Juan Guaidó has declared himself the interim leader of the country, while calls are growing internationally for President Nicolas Maduro to step aside. But what is the historic context behind the ongoing political polarisation in Venezuela? Maria Armoudian speaks with Daniel Levine, Jennifer McCoy, and David Smilde. Daniel H. Levine is Professor Emeritus in Political Science at the University of Michigan. He is the author of Quality of Democracy in Latin America. Jennifer McCoy is a Professor of Political Science at Georgia State University. David Smilde is a Professor of Human Relations at the University of Georgia. He is the author of Venezuela’s Bolivarian Democracy: Participation, Politics, and Culture under Chávez. I want to start with a historic context that gives us an idea of today’s Venezuela which seems very polarised. David Smilde you have studied the movements that have brought us to the current situation, what historic context do you think we need to know to understand this? David Smilde: Well I think to understand the current context and especially polarisation, I think you need to understand the fifteen years before Hugo Chavez in which from 1983 to 1997 there was a really dramatic increase in social polarisation. Poverty doubled, inequality doubled, there was a real deterioration in the lives of a lot of average Venezuelans. Chavez was elected in 1998 at the end of a cycle of real deterioration of Venezuela’s electoral democracy, especially in terms of the political parties. And he is elected, comes in with a program of participatory democracy and pushes through a new constitution, and during these first couple of years has a high level of popularity. At the end of 2001 and the beginning of 2002 things really start to deteriorate in a sense that Chavez then starts to move towards trying to push social and economic democracy and really try to change the economy and that is when the real polarisation begins. Since then, in Venezuela both sides have not wanted to recognise the other side and their legitimacy and so both sides really see themselves as fighting for their lives, and that leads to greater polarisation. Chavez as everyone knows passed away in 2013 and that bought Nicolas Maduro in as President, but this polarisation process continues to this day even. Jennifer McCoy what else do you think we need to understand? Jennifer McCoy: I think what we see in Venezuela we have also seen in other Latin American countries. In cases where there is deep inequality, especially income inequality, but also it can be discrimination against groups of people such as indigenous people – when you combine the level of grievances of people who have felt ignored or excluded for a long time with the right to vote then we see a real demand for change. And in countries where the institutions aren’t strong enough, where the political parties and the government aren’t strong enough to manage that change, then you can go in unpredictable directions. So in the Venezuelan case, the political parties who had been very strong in the 1970s and 80s became discredited in the 1990s as people were sliding into poverty, oil prices were down, and so people voted for change and radical change without a clear knowledge or guide of where Chavez would go. Daniel Levine: It is certainly true that the situation is very polarised. One thing to note is that the whole political system that Chavez replaced was one which tried to mute polarisation and then after a while that it became impossible to mute the polarisation because of the elements that David indicated. Secondly, Chavez and now Maduro helped accentuate polarisation in their rhetoric, in their public mobilisations. It has been a government which has thrived on mobilisation and polarisation. So in terms of purely political polarisation I think it has increased, but this has been strategy of this regime and government and will probably continue to be one in the future if Maduro remains in power. It strikes me that there is a very black and white thinking that has emerged with Chavez and now Maduro, a sort of a good guy vs bad guy that has really resonated with people. Would you say that was part of the construction of power? DL: Absolutely. Chavez was partly the product of the decay of the previous system. He didn’t cause the decay of the previous system, the previous system had many problems as everyone knows but he is sort of the product of that and of the discredit of that. His whole original campaign was ‘I am not them’ and he called for a re-founding of the republic and a political strategy which has been imitated in other countries: calling for a new constitution, redefining the basis of the nation, and he was very active in an Us v Them kind of rhetoric. This has continued with Maduro who has used many of the same phrases and rhetoric that Chavez used. JM: I think also when we see in a country really deep grievances, that people can and often do vote for a strong leader…In Venezuela, Chavez was a dominant figure unlike Venezuela had seen in decades and he definitely had the personality, had the charisma, the communication skills and the ambition to insert phenomenal power and generate a love-hate relationship with many people. So as Dan said, there was an incredible devotion of many people who felt like they were receiving for the first time the respect of a leader who also gave them a voice and represented them. He emphasised how he came from humble roots like them. And then there were those who felt excluded from his vision and from his government who had been very strongly opposed to him and felt like they were losing their own lifestyle. And that is why the debate has been between people who felt like there were two directions for the country to go and where one side would lose the essence of their lifestyle. David Smilde, you have been following the civil society there and creating a democratic system of sorts that have been different from the historic democracy in Venezuela. How would you describe what it has become? DS: There have been a number of different phases throughout the Chavez and Maduro government. Chavez came to power and the real key metaphor for Chavez was participatory democracy. This was the idea that if we could just get enough of all these civil society and social movement groups involved, that would deepen democracy and that would create a democracy that functions better and meets the country’s needs. Of course, the problem is when you actually try to have a governing project and you have this cacophony of voices it can be very difficult to get anything done. By 2002 or so, Chavez was clearly moving to a much more centralising logic to his governing project and traditional civil society was largely excluded. In fact, in the period of 2002-2004, the opposition to Chavez’s government referred to itself as ‘civil society’. 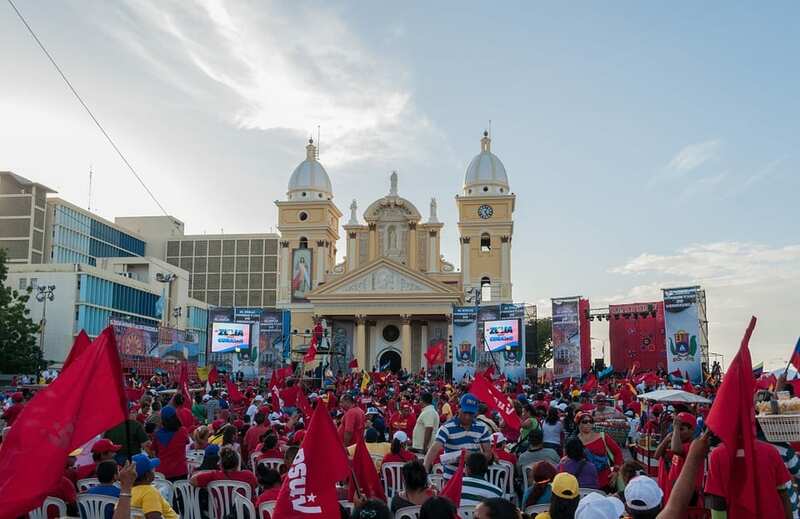 When there was a coup in 2002 that took Chavez out of power for 48 hours, at that moment it became really clear to the government that the pro-government civil society groups were very important to their survival. And so after that period for a number of years they really started supporting and founding all kinds of social movements and pro-government civil society groups. By 2006 that became a much more robust effort to really try to create and control these citizen participations through groups like councils, cooperatives, and communes. And so now we have this much more corporatist project in which the government has this idea that with the next stage there will be articulation from the citizen all the way up to the executive branch through these different levels of participatory initiatives. So it has become something quite different to what it originally started as. Jennifer McCoy, I believe you called it a hybrid democracy, sort of democratic but it had these authoritarian qualities. How would you describe this? JM: There is a big debate over how to characterise the democracy among a lot of observers, journalists, as well as scholars. Certainly, the electoral basis of the regime is clearly democratic. The new kinds of participatory mechanisms were a way to deepen the democracy and create more avenues of participation. On the other hand, the sort of traditional liberal democracy approach that many people in the US favour in terms of a strong emphasis on the separation of powers, independent branches of government, that is what has become blurred in Venezuela with the strength of the governing party basically controlling most of the branches of government and the democratic institutions. So many in the opposition in Venezuela felt like that they are not independent of political influence from the government, and that is where the debate lies with that liberal democracy vision versus the more participatory democracy vision that the Chavez movement tried to implement. Daniel Levine you tried to separate the idea of democracy from good governance or good results. How would you characterise Venezuela’s quality of democracy? DL: I would call it a democracy of low-quality but still a democracy…This is the most centralised government and the most highly personalised government in eighty years or so. Chavez concentrated more power in himself than any president since Juan Vicente Gomez, and that is a lot. As for the courts and the question of whether or not there is independence in the branches of government, the fact is that there is no independence in the courts, it is just a joke really to talk about it. There are elections, there are significant questions about accountability of government officials and transparency – there basically is very little. I wanted to comment briefly on the question of this so-called alternative project for participatory democracy. There is a lot of doubt about the actual independence of these groups and the extent to which they are civil society groups functioning from below or whether they are mechanisms of control and transmission from above. The research that I have seen from Venezuelan scholars indicates that participation in many communal councils is very spotty, highly tied to membership in or getting benefits from the government and they are just not independent groups as we conceive of civil society. So if you are talking about an alternative form of participation, I think it is important to factor in that it is a form of participation which is highly structured and shaped from above. So there are significant problems of accountability I think and there are some questions about the relative autonomy of these civil society groups, particularly the communal councils. DS: I think that’s exactly right and I think you could actually go beyond that and say there’s not really a question about the autonomy of these groups. The government had a very specific project that these groups should not be autonomous, that they should be part of this whole project that extends from the presidency all the way down through several levels all the way to these projects. They are seen as something that should be part of this national project, they should be articulated with the national vision. Of course, it is an ideology that is very much of a corporatist type ideology that goes back to a very different political culture…We have to be the nation and morality comes from the collectivity and everything is part of one organism, this general will. And so I think, absolutely there is not much autonomy and the aim of the communal state is to erect a whole new geometry that really gets rid of the idea of autonomy because they don’t really believe in it. Jennifer McCoy one other aspect of your research that deals in the issue of corruption. You seem to have argued that addressing that as the core issue has been part of the problem. What is the situation? JM: In Venezuela, in part because of oil wealth, there has been always an issue with corruption, particularly as oil prices get high. There is a lot of money to go around and a lot of people benefit in positive ways and legal ways, but there is also a lot of opportunity for corruption. Venezuela has had in the past problems with corruption in terms of exchange rate control back in the 1980s and similarly in the recent past. It is very hard to measure, to know what the level of corruption is now versus the past but it is a persistent problem in Venezuela. And the way to address it is to have accountability mechanisms – which gets back to one of Dan’s points – you need transparency and accountability mechanisms and you do need to have oversight mechanisms, institutions that are sufficiently independent to be able to investigate and to hold the government to account. And transparency about budgets, about public spending so that citizens can also hold their elected representatives accountable. It has been difficult to get some of that information to be able to really assess and for citizens to be able to investigate enough or to hold their government to account. And then you also get to the question that Dan was discussing about the courts and the other accountability mechanisms. How do you see it shaping up in the future in terms of the balance of power? DL: I think there are various possible scenarios for the future. One that occupies my mind greatly is endemic conflict. It is a very polarised society, and as everybody knows each side distrusts the other and sees the other as a threat. What bothers me is the possibility of violence in the future between these sides which has never really been a feature of Venezuelan political history in the modern period. But it could happen. There is a precedent in other countries for this such as the long-term low-grade hostility between Peronistas and the military in Argentina, anything is possible. I think the country has immense problems. Its infrastructure is falling apart, inflation is very high, imports are very high, the currency is not in very good shape, they produce less petrol and import more than they used to, violence is a problem, there are a lot of problems which any government will have to address within Venezuela, and whether or not they will be able to do so isn’t clear to me. Could Venezuela’s nightmare soon get worse?